Dawn officially arrived at Vesta on Saturday/Sunday, and will spend the next three weeks in its first orbit as the team looks for (tiny) moons, and finely tunes the method by which it will move into a closer orbit in order to begin the actual science mission. As frequently noted, this mission is unique in that the object Dawn will be orbiting is one that we only have approximate (fairly accurate but still approximate) measurements of for its mass, so the extra accuracy gained over the next three weeks will aid in knowing exactly how much fuel to use. Vesta's main mountain (apparently this is the south pole) is more detailed than ever before, and now we can see some sort of ridge at the top of the mountain itself. Speculation on the origin of the mountain is tectonic activity or an impact on the other side. 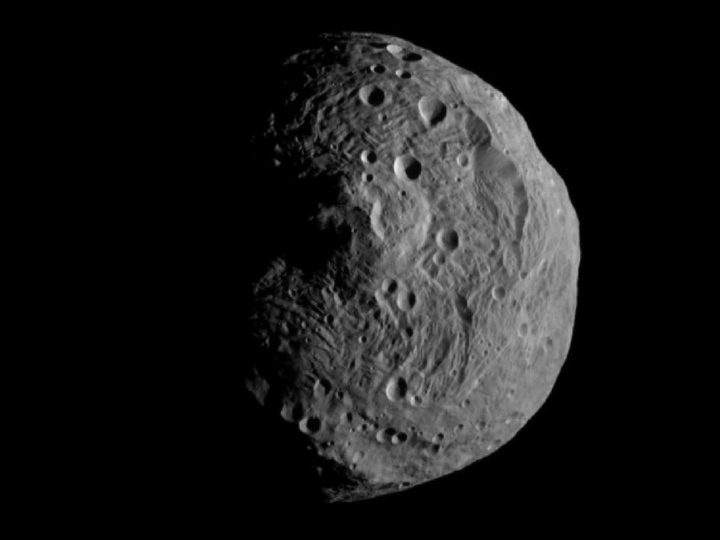 I often mention that surface area and perimeter should be given when referencing asteroids along with diameter, as these measurements mean much more to us as humans than diameter, the distance from one side of a body to the other if you happened to be capable of digging through it and coming out the other end. Since we can't do that, it helps little in picturing what it would be like to stand on the surface. With a diameter of 540 km we end up with a perimeter of 1700 km, meaning that to walk from one pole to the other it would take about a month or a month and a half, depending on your walking speed. Dawn will eventually reach an orbit as low as 180 km, so 90 times closer than this image released today. Eventually we will know more about Vesta and its mysterious mountain than even some of the most familiar planets to us - Jupiter, Saturn, etc. I'll probably ease up on the Vesta posts for the time being as there should be enough easily available coverage of the Dawn mission on just about any space and science site, though I will keep a close eye on what I believe matters most: not Vesta itself, but whether seeing a protoplanet like this close up changes our view of the Solar System. 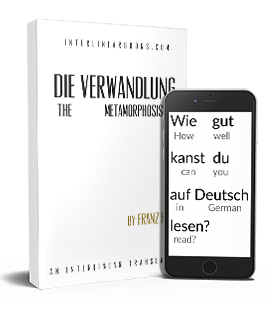 More precisely, whether it changes the nature of the debate over where we should explore first. Right now the only destinations discussed seem to be the moon and Mars, but hopefully Dawn will help bring to light the vast number of other potentially habitable locations to choose from. My preferred destination at the time (after the moon) is 24 Themis. While smaller than Vesta it is still quite sizable at 200 km, and more importantly: it has water on the surface, and an orbit that fits exactly on the same orbital plane as the rest of the planets. 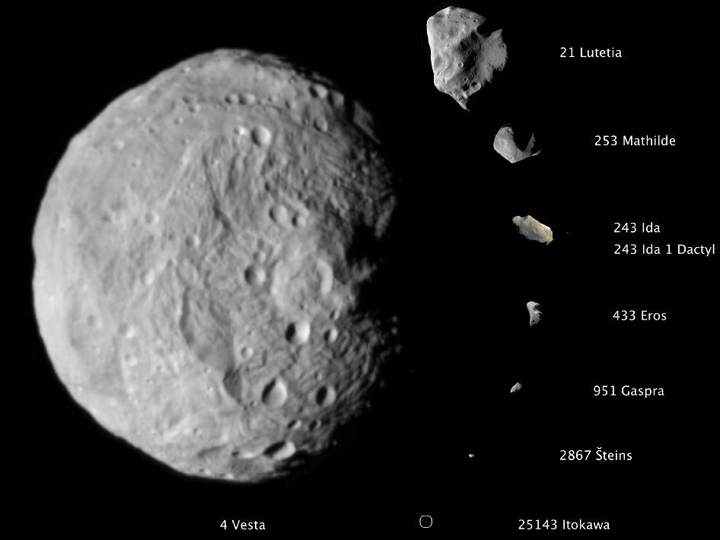 Let's pretend for a second that it has exactly the same shape as Vesta. If so then a comparison of the two would look like this.